I usually post recipes for salads and dressings at the beginning of the year because that’s when we tend to be more interested in eating healthy. 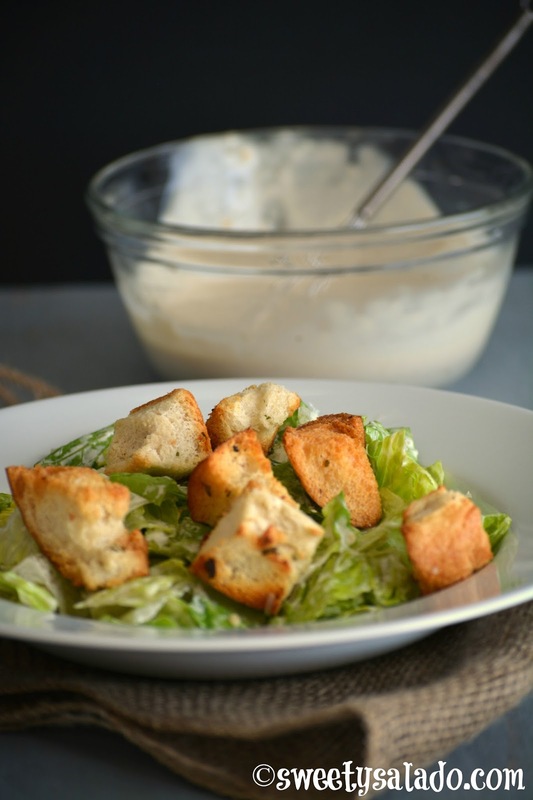 But I decided to post the recipe for this Caesar salad now that summer is just around the corner because it’s really not the healthiest of salads given the amount of mayonnaise that we use to make the dressing, and also, because it’s perfect to serve chilled during the hot days of summer. The dressing for this salad is originally made with raw egg yolks, but since all the requests that I have received to make this recipe have been to make it with the mayonnaise dressing version, then that’s the version I am posting today. In any case, the flavor is very similar to the original dressing version, but to be completely honest, I like this one better because it comes out a lot more creamy. 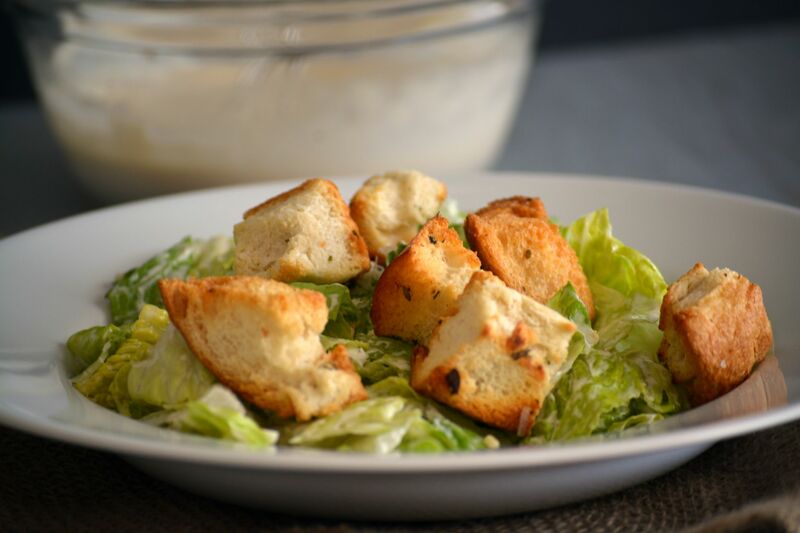 You can also make the croutons at home and if you want to see the way I make them, here’s the link for that delicious recipe: Homemade Croutons. In a medium bowl mix the mayonnaise, ¼ cup (25 g) Parmesan cheese, anchovy paste, mustard, Worcestershire sauce, lemon juice, garlic and season with salt and pepper to taste. If the dressing is too thick to your taste, you can thin it out by adding a little bit of milk. Place the dressing in the fridge to chill. Chop the lettuce into bite sized pieces and place them in a large bowl. Add the remaining amount of Parmesan cheese and toss well. Pour the desired amount of dressing and toss again. 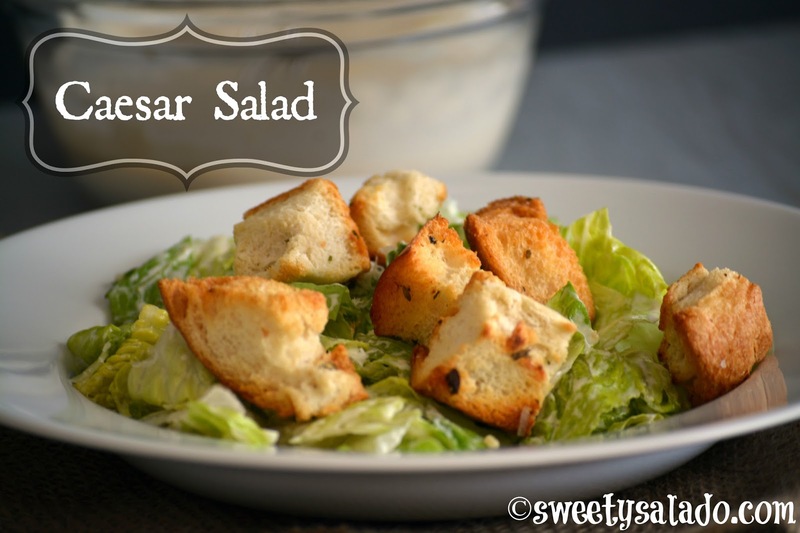 You can serve this salad with homemade croutons.